From the author of prize-winning Arrival City, a controversial and long-overdue rejoinder to the excessive fears of an Islamic threat that have spread throughout America and Europe and threaten our basic values. Since September 11, 2001, a growing chorus has warned that Western society and values are at risk of being overrun by a tide of Islamic immigrants. These sentiments reached their most extreme expression in July 2011, with Anders Breivik’s shooting spree in Norway. Breivik left behind a 1500 page manifesto denouncing the impact of Islam on the West, which showed how his thinking had been shaped by anti-immigrant writings that had appeared widely in books and respectable publications. 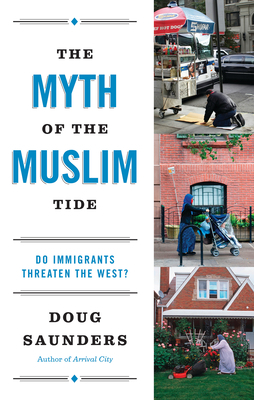 In The Myth of the Muslim Tide, Doug Saunders offers a brave challenge to these ideas, debunking popular misconceptions about Muslims and their effect on the communities in which they live. He demonstrates how modern Islamophobia echoes historical responses to earlier immigrant groups, especially Jews and Catholics. Above all, he provides a set of concrete proposals to help absorb these newcomers and make immigration work. The most important trend of the twenty-first century will be a massive global migration to cities and across international borders. Rather than responding to our new religious-minority neighbours with fear and resentment, this book shows us how we can make this change work to our advantage. Doug Saunders is the European bureau chief of The Globe and Mail. He is the author of Arrival City, which won or was a finalist for several prizes and was published in eight languages around the world. "Brilliantly detailed and statistically unarguable. . . . Saunders knocks down all the arguments of an Islamic wave destroying the Western democratic paradise (cough) with the ease of Roger Federer smashing away badly aimed lobs." "Doug Saunders may be on his way to becoming the most important journalist in the Canadian mainstream media. . . . In a cool-headed manner, Saunders dismantles [Eurabia] claims one at a time with a relentless onslaught of facts. . . . At times, Saunders's book reads like a doctoral dissertation as he bludgeons readers with data. But in light of all the hype about the so-called Muslim threat, it's a prudent approach because it makes Muslim-tide authors like Steyn, Bruce Bawer, Melanie Phillips, and Christopher Caldwell look like buffoons. . . . The Myth of the Muslim Tide is a welcome antidote and for that reason alone, it deserves wide readership." "Sensible, fact-driven. . . . Doug Saunders is a journalist of the rare kind these days. He actually researches, explores, investigates and only then reports on the major trends of our global community." "Using an exhaustive supply of numbers, trends and comparative history in a slim book, Saunders makes a strong case for his arguments, which are meant to challenge those alarmists who think Islam will eventually dominate Europe and North America." "Thorough, fact-dense and convincing. . . . An impartial examination of the notion that Muslim immigration urgently threatens Western civilization. . . . Ultimately, Mr. Saunders’ book provides a perverse sort of hope: Catholics and Jews overcame precisely the same sorts of suspicions Muslims now face to become more or less unquestioned members of Western societies. By the time Muslims are supposed to be taking over the entire Western world, perhaps they will instead join hands with their fellow citizens in worrying about the next wave of immigrants—or better yet, not." "A compelling case. . . . Draws uncanny parallels between modern-day Islamophobia and the outmoded anti-Semitic/anti-Catholic rhetoric of our past—and it refocuses our attention on the real immigration problem we should be worried about. . . . Its reassurances and warnings resonate." "An invaluable contribution to the contemporary debate over Muslim immigration and integration into Western communities. . . . The author takes a nuanced, informative look at the alarm that has greeted the latest wave of Muslim immigrants to Western countries and explains, with admirable precision, why this response is unjustified. . . . Saunders’ approach is refreshingly levelheaded and fact-based; he reproaches those who have allowed fear and anger to overwhelm reason, while acknowledging that terrorism and religious extremism pose real dangers to Muslims and non-Muslims alike." "Cogent and timely. . . . Saunders sets out to correct the rumors and misinformation that plague the world's second largest religious group. . . . Saunders proceeds to systematically denounce numerous alleged ‘facts’ or perceived trends (e.g., the rate of Muslim immigration will increase; Muslims are guided by an ideology rather than a faith; terrorism is inherent in fundamentalist Islam; etc. ), and then offers some solutions."